Last Tuesday I testified at a policy meeting in Washington. One point that came up was the frequent wrong impressions patients encounter among medical staff regarding medical records. The truth is, you’re entitled to a copy of your medical records. Don’t let anyone tell you “That’s not our policy”! We also discussed how useful it would be if we had some quick, informative, entertaining training tools to convey points like that. Well, why wait for an act of Congress? I made one up. Click to view, print, or download the full page PDF (413k). 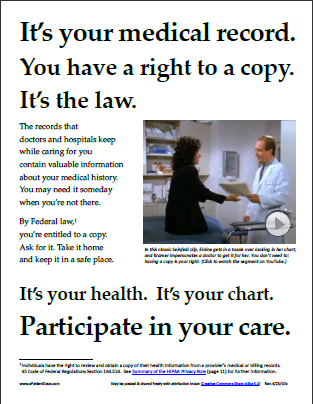 The clip in this flyer is from Seinfeld episode #139, “The Package.” It was first broadcast on October 17, 1996, eight weeks after HIPAA was signed into law. So when this episode aired, Elaine was not entitled to her record. Today she would be. My husband had a primary care doctor (that we fired after they made some serious errors in his care) who worked for a practice that insisted on $0.25 PER PAGE fee for records. This was even for sending those records directly to his new physicians office for continuity of care. I flat out refused to pay and wound up only getting his last set of labs sent (without charge). But honestly, I think that part of HIPPA is broken and needs to be fixed. I agree w/Stitch…can get medical records, but at a significant cost. Was charged $10 for a discharge summary, which was about 5 pages long. Also, in the hospital, there are so many ridiculous barriers if you want to the medical record. Have to sign legal document, and depending on the institution, have either a nurse or doctor present when you read the record (condescending and intimidating). They then document that you read the record, a red flag to the health care team. At one hospital where my daughter was inpt, was told by the attending MD that I can only view the record when an attending was present, and he didn’t have time to be there when I went through the record. So I wasn’t allowed to view the record. Anyway, why didn’t I trust them? Yes, the law specifies that doctors may impose reasonable copying costs. Most states have now specified what constitutes “reasonable costs,” and a couple have specified that records must be provided for free. The lovely folks at Lamb Law Offices (no affiliation) have compiled this list by state of the laws governing those costs: http://www.lamblawoffice.com/medical-records-copying-charges.html. My luck, I’m in Texas, where they can charge up to $25 for the first 20 pages and $0.50 per page thereafter. Note also that some states list allowed “processing” and “retrieval” costs. The HIPAA implementation laws trump those processing and retrieval allowances. Those costs are forbidden. Dennis, this is the first I’ve heard of the processing and retrieval costs – not sure of your meaning – are you saying those charges existed before the HIPAA regulations banned them? Yes. Before HIPAA, requests for medical records were frequently met with processing or retrieval charges. The HIPAA implementation regulations do not allow processing and retrieval costs, just “reasonable copying costs.” If you look at the list of state laws governing record costs, you’ll see that some state’s laws allow retrieval fees. Texas law, for example, allows hospitals to charge for postage/shipping and for retrieval or processing for recovering records from microfilm. In such cases, the HIPAA prohibition on retrieval fees trumps the state laws. The problem is that some of those state laws were written pre-HIPAA and haven’t yet been emended. In any case, “reasonable copying costs” alone can certainly add up when the various states consider costs as high as $2.50 per page (see Ohio law) to be reasonable. I requested a patient’s records from a ten-day hospital stay in 2009. The cost of copying 95 pages was over $150. That’s reasonable? Exactly my point Dennis. I think that it’s one thing to charge for copies when litigation is involved and a lawyer hires a copy service to go in and make copies. But I think providing a copies to a patient, for personal use, within reason, should be part of the cost of health care. Just as ethically, there should be no cost to the patient to provide copies of records expressly for continuity of care. Ich würde denken, das dat schon wichtig zu wissen ist. Trotzdem muss Jeder es für zu seinem eigenen überlegen was er oder sie macht.. In this technology age, there should be no paper issues, no copy charges, etc. I should be able to bring in my own cd or thumb drive & my records should go directly to it. It’s that easy. I don’t understand why dr’s want to hold our records hostage…no, actually, I do. They’re freakishly Type-A personalities with serious control issues. They want to nickle & dime their patients (and our patience). Seriously, I just had some annual bloodwork done because I have RA. Can I see my bloodwork? Uh, no. The lab won’t let me have a copy because it has to go to the dr who ordered it. And now, I have to waste not only money, but time to go sit in her office for her to tell me absolutely nothing. I can read. I know what “within normal range” means. Or “abnormal”…or “high” or “low”. And I have the same internet she does so I can look up and get better answers than she will give me for anything I don’t understand. — And I have yet to decide what’s worse — major joint deformation or sitting in their stinking offices for the rest of my life so they can cure me of RA to kill me with the cure. GREAT POSTER Dave! I love it and will put a link on our site. The issue is costs; especially if you’re trying to get a copy of a hospital record. State laws vary, but many are ambiguous and fail to set limits on what hospitals can charge you. In NH and several other states, they can charge 50 cents/page! The hospital that infected my mother, failed to rescue her, gave her a secondary ventilator-associated pneumonia, and a bedsore all within 3 weeks of surgery (oh, I forgot…she had a pain level of TEN in the recovery area because her epidural wasn’t working and they couldn’t get ahold of the anesthesiologist)……anyway they wouldn’t release her records to us unless we paid $600.00. This hospital got paid hundreds of thousands of dollars for this ‘care’. After filing complaints all the way up to the president and then having the president tell me that we shouldn’t expect ‘special treatment’…he finally caved and only charged us $100. The bottom line is that until we have state laws that serve consumers of healthcare first, this practice will continue. As soon as you ask for medical records you are treated like a plaintiff. This is a great post and poster! I plan to use it in our new academic medical center. I was shocked when I actually read the law and found that if you read it from the perspective of benefit for the patient, it has a lot of good stuff in it (the intent is good). But when hospital risk managers and lawyers read it, they have interpreted the law based on what is best for the organization (hospital, medical center, physician practice, etc., not the patient). As I continue to learn more about starting an academic medical center in a new person-centered model, I am finding this is a common problem in healthcare (interpretation of law based on what is best for the doctors office or the medical center instead of what is best for the patient). This thread conjures up more questions than comments from me. Dave poured his data into a spreadsheet and used it in meaningful ways. I wonder how many other patients want to do something meaningful with their medical data vs. how many desire it just because it is their right. Much of the language is difficult to understand. Regarding the grass-roots poster, the Seinfeld clip is funny. Besides passing the poster around on the Internet, where do you envision such a poster hanging? I don’t think many medical offices would display it.